DC Comics's New 52 initiative has been a successful fresh start for the company, but to some extent it's still been "comics as usual" -- crossovers, creative team changes, stories that work and stories that fizzle out. One title that has seen a real reinvention of comics -- not "comics as usual," but rather something truly different and new that would appeal to non-fans who already think they know what comics are "all about" -- is J. H. Williams and Haden Blackman's Batwoman. The strong plot aside, Williams utilizes not just complex paneling, but also a number of inventive artistic tricks that enhance the story. The art in Batwoman says something on its own; it doesn't just sit on the page in companion to the dialogue. 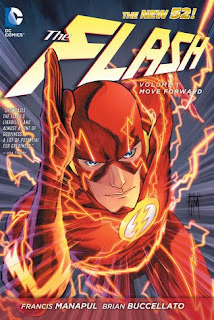 Another of these impressive titles is Francis Manapul and Brian Buccellato's Flash: Move Forward. The creators offer a Flash Barry Allen that is thankfully free of years of excess baggage, including the specter of his own death. In the previous iteration of his title, Barry been routinely anachronistic and also terribly dour; even despite what Flash fans have lost in the transition to the New 52, Manapul and Buccellato's Flash recaptures much of the joy inherent in Barry that makes him a viable character, which creators like Geoff Johns have championed but failed to be able to show. Barry is a little nerdy, a little square, but he also loves his powers and loves learning about them, and the reader gets caught up in Barry's enthusiasm. Moreover, however, Manapul's art in Move Forward is a visual feast. Manapul's work already deserves praise for his meticulous action sequences and his ability to draw attractive characters without sexual gratuity; but in Flash, Manapul employs all of that plus creative paneling, perspective shift, and numerous outstanding visual cues all to bring the Flash and his world more alive for the reader. Flash is more than just the average comic; they should all look this good. In Move Forward, the Flash faces conflicts from within and without. An old friend of Barry's resurfaces, chased by an army of clones called Mob Rule. An electromagnetic pulse, seemingly related to Mob Rule, plunges Keystone and Central cities into a blackout. And Barry realizes his ability to "think fast," considering millions of options in seconds, though he finds this brings him as much utility as danger. These subplots coexist on the page, often plaguing Barry simultaneously -- in effect, Move Forward is about a lot of different things, separate but related, and this works well, both to keep Flash constantly interesting and to reinforce the sense that the reader is moving with Barry at lightning speed. The audience later learns that Barry is responsible for the blackout due to inadvertent time travel; if the readers go back to the book's second chapter, they can see where Manapul and Bucellato pull a slight of hand to conceal this until the final revelation. Flash quickly becomes a book that has to be read very carefully. There's a set of five pages also in the second chapter that form a kind of Rube Goldberg, non-linear puzzle in which Barry visualizes and stops a handful of crimes before they happen, depicted through a series of panel cues. Lest this become old hat, the creators shift this trick in the fourth issue such that what the panels depict and what Barry visualizes isn't always what happens, but sometimes only what Barry incorrectly thinks might happen. This is complicated stuff, wonderfully requiring more from the reader than the average issue of Batman or Green Lantern does. All of this is without even mentioning Manapul's deftly shaped double-page spreads (at times, multiple double-page spreads in succession), or that at times the creators even have the characters fall through three-dimensional panels. It's something else. Arguably, Move Forward isn't quite a Flash story. Barry appears here, has speed-related conflicts, and Manapul and Bucellato get points for making Mob Rule an old friend of Barry's and not just a citizen in distress. But Manuel Lago is too new a character for Flash, even despite the New 52 reboot (rather this was Chunk, for instance, or one of the Rogues), so it's difficult for the reader to sympathize with Barry over the plight of his friend -- the conflict is Flash-specific, but emotionally Lago could as easily be an old friend of Bruce Wayne or Clark Kent. At one point Barry, unconscious, leaves the story entirely; this offers a good spotlight for Lago and the Flash supporting cast, but Barry is gone long enough that the first arc of Move Forward begins to feel like Lago's story with Barry in a secondary role and not vice versa. The last three chapters of the eight-issue Move Forward jump, somewhat jarringly, from the Mob Rule story to Barry's conflict with a newly-enhanced Captain Cold, and from there Barry is thrust into the Speed Force. Keeping with Move Forward's overall aesthetic, the creators never "slow down," but it seems to make it hard to collect the Flash title -- the book ends on a jarring cliffhanger. If five issues would have been too small a collection for Move Forward and eight issues is at the extent of what DC has collected for the first New 52 volumes, it would appear there's just no good place to break Flash between books. More Forward doesn't read poorly, it just ends suddenly, and it'll like read better with the next volume in tow. There are a wealth of nods to Flash stories past in Move Forward, from the Cosmic Treadmill to Rogues like the Top ("Turbine"), Pied Piper, Trickster, and Golden Glider. In-jokes are fun, but at times these get cloyingly too clever, akin to similar teases on Smallville, for instance. More than in other DC New 52 titles, Manapul and Buccellato position Barry as at the beginning of his career, but they also drop more hints than most as to how Barry might someday grow to become the "old" DC Universe Flash. This is entertaining, but it seems the wrong way to go. From this beginning, the reader can already see the Rogues returing and Barry inevitably dating Iris West, and as such those aspects lack suspense. Manapul and Buccellato offer a gorgeous book package, not to be overlooked, but in some ways it's too similar to what came before. Those concerns aside, however, Flash: Move Forward sets a standard for a smart book, deftly drawn. As these reviews have stated before, if every artist drew like Francis Manapul, the DC Universe and the comics landscape would be a much different place. If this Flash book stumbles only slightly, there's plenty of evidence that the writers will get it back on the right track. Next week -- back on our "Young Justice" track with the Collected Editions review of Legion Lost: Run from Tomorrow. See you then! Looking forward to reading this one, but I feel like I should read Flashpoint first. Not because I think that it's required story-wise (that is, I don't think there are any Flashpoint references here), but I feel like I need to finish reading about "that" Barry before I start reading about "this" Barry. Glad to hear the New 52 Flash is on the right track. As I think I've mentioned before, the Flash book can really drag down with "intermittent" writers, and does best when there's a long term writer at the helm (Messner-Loebs, Waid, Johns). You're less neurotic than I; I don't believe I could have started reading the New 52 at all without reading Flashpoint first, irrespective that the New 52 hardly references Flashpoint. I've been reading some of the New 52 Bat-books, Resurrection Man, Swamp Thing, Justice League and Aquaman. I was okay with those because I felt I had finished with the pre-52 versions (and in the case of Batman, there wasn't many differences anyway). I haven't read any of the 4 Green Lantern titles yet, just because I only recently finished War of the Green Lanterns. But Flash, in particular, was the one title I felt was important enough to me, and different enough from the pre-52 version, that I had to finish with the old Barry before I could read the new Barry. As a person who read and owned A LOT of pre-Flashpoint Wally and Barry, as well as reading the current single issues of New 52 Barry Allen...this is a great start on legendary character. One of the biggest selling points for new readers, which you pointed out, is the all of the past continuity is borderline thrown away (except the noted references). And although most fans hate that (especially Wally West fans), new readers don't have to be bogged down by excess Flashes, villains, and excess time travel mummbo-bummgo. The other thing, is the portrayal of Barry. Pre-Crisis Barry was no where near as interesting as Wally. And although Geoff Johns did a commendable restart for him...this is the essential jumping on point for the new Flash fans and Barry Allen. And Franics Manapul's art is becoming the definitive Flash artist. As for faults, yes, I too feel that Barry is more of a secondary character. The ending is uncalled for. DC should of collected this as issues 1-7, not 8. Issue 7 has a better cliffhanger (if that makes sense?) then issue 8, I think. But other than that, New 52 Flash is one of the best of the heap, even if it's not getting the same attention like Batman, Wonder Woman, or Aquaman. Vol.2 will start assembling the Rouges, which, I think, isn't quite as good as vol.1 (though still worth looking at). That's it. I'll wait til Vol.2 to discuss further, as to not give away plot points. Volume 2 would probably collect issues #9-16 and the 2012 Annual, so as to complete the story arc. Also: ordered this already. Long-term Flash fan, and this art is too sweet to give up on. As a coffee-table edition, it's miraculous. Manapul is really having fun with the layouts and breakdown of the story on this book! I have to disagree with your review CE. In regards to the story itself, I didn't feel the writers made Barry Flash (the character itself) compelling enough, besides simply being a really cool cause he's has a awesome superpower. The first story arc involving Mob Rule started out decent, eventually became something I wasn't interested in. I didn't feel the "mob" to be any kind of threat to Barry Allen or tested him character-wise. As to how the story was written, it didn't flow very well. There was a lot of time when there was more telling than showing. The biggest example of that was the last issue where a few double page spreads was just words telling us what was going instead of actually showing what was happening. And their explanation of the new Speed Force was just...blah. Issue 6, the fight with Captain Cold was jarring with the constant back and forth throughout the different times. I understood what the writers were trying to do but it left me wanting a more straight forward story. And the art, Francis Manapul is awesome, but there were sometimes when I wish he would just tell the story, and not try to impress us with his crazy layout/interesting storytelling methods. An example of this is issue 2 when Barry Flash discover how to use the Speed Force in his head that allows him to see the different potentials in each scenario; it wasn't drawn/explain clear enough for me to understand what was going until it was explain to me a few panels later. I wouldn't say I disliked it, but more disappointed. I don't know if I will pick up Volume 2 when comes out later next year. I take all your points, Jackie, and no disagreement here. Definitely the jump from the Mob Rule story to the Captain Cold story was jarring; and the revelation of the Speed Force definitely didn't move me as much as Mark Waid's did once upon a time. For me, Buccellato and Manapul are striving for something more than many other creators are, and that's enough for me to stick with it, but indeed the book wasn't perfect. Just finished reading this. The art was great, and reminded me of a "brighter" Batwoman, as it used similar layouts/panel styles. Unfortunately, two-page spreads can be difficult to read on an iPad. These spreads tended to be much easier to navigate than JH William's in Batwoman, though. I thought the whole mini-panel trick with what Barry was "seeing" with his brain in speed force mode was good, and I liked (as you said, CE) the second time when Barry "saw" something and then it didn't happen! All of that being said, I was a little disappointed with the "writing". The story didn't really grab me, and some of it felt very much like standard super-hero fare. That is, the story itself didn't feel particularly innovative or compelling. Maybe it was, as you mentioned, no previous emotional investment in the Manual Lago character. Ironically, if anything, reading previous Barry Allen stories probably hurt in reading this book. I find the whole Iris West relationship awkward, for obvious reasons. It's so obvious that it's going to happen, but you don't know when, but if it doesn't happen then that will probably not feel right either! I think if I were a "new" reader, I'd be more comfortable with the Barry/Patty/Iris dynamic (and I do like that Barry and Iris did go on one date, just to establish that there was "something" there). When it comes to "reporter girlfriends" in comics, there's always that question about how much the woman cares for the story versus caring for the hero. That is, is Iris just using Barry to get inside police intel? In this case, it seems like Iris isn't NOT doing that, but at the same time, she has a romantic interest in Barry, perhaps even stronger because he has another girlfriend and so is "unattainable". So, I guess what I'm saying is, I liked this first volume, but it didn't feel "epic" to me, certainly in light of Barry's involvement in Flashpoint, Blackest Night, Crisis, etc. I am looking forward to the re-introduction of the Rogues, though.